#3 of 25 Top Family Resorts in the U.S.
2019 TripAdvisor’s Travelers’ Choice Award Winner 4 Years in a Row! 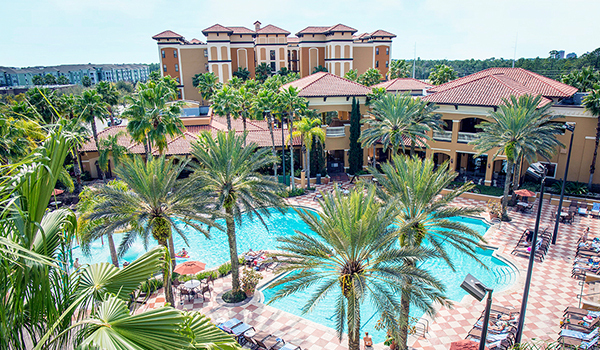 We have everything you need for a family vacation in Orlando. When your family stays at Floridays, everyone can enjoy the spacious two or three-bedroom, fully-equipped suites nestled on 20-acres of beautifully manicured, tropical-landscaped grounds. Spend hours lounging poolside while the kids enjoy the children’s splash area and sandy beach or just relax at the poolside bar after a long day at the theme parks. Our accommodations include well-appointed suites with family friendly floorplans, Mediterranean style decor, and modern furnishings. Reserve two or three bedroom suites and enjoy all the conveniences of home. Whether you're on vacation or a business trip, Floridays Resort Orlando is ready to impress with grand suites and poolside hospitality. Get everything you need to know about Florida with our personalized concierge. Get the best price when you book direct with us by visiting our offers page. Once there you can find our current offers and choose the one that's best for you. Create memories that will last a lifetime at Floridays! When you book direct with us, you are guaranteed to get our lowest rate with 20% off the standard rate plus breakfast for 2 daily. 8/16/2018 – Calling all foodies! It’s time to get ready for the ultimate global feast known as Disney’s Food & Wine Festival. Starting August 30, 2018 to November 12, 2018 you’ll have a chance to sample some of the world’s greatest cuisines while exploring Epcot. 7/20/2018 – All of our suites come with a fully equipped kitchen, but what if you don’t feel like cooking? It's your vacation after all. Luckily for you we’ve got a poolside café ready to make your breakfast, lunch, dinner, and any meals in-between fresh to order.